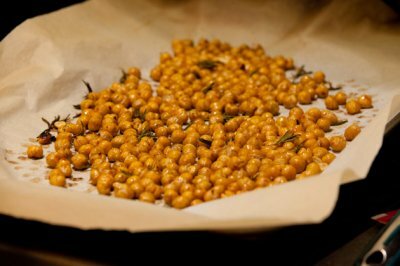 Rosemary and lemon infused chickpeas. Perfect as a salad topper or quick, healthy snack! Combine all ingredients in a medium-sized container. Place a lid on the container and shake to combine. Store mixture in the fridge for 3 hours or longer to marinade. When ready to cook, set oven to 400F and line a baking sheet with parchment paper or a silicon baking mat. Strain half of the lemon juice from the mixture and dump the contents of the container on the prepared pan. Place in oven and cook for 35-40 minutes until crisp-tender, rotating every 15 minutes or so. 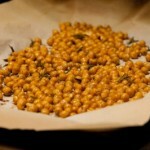 To store, place in an air-tight container and keep in the fridge for up to 5 days.